WE BRING YOU THE BEST WISCONSIN HAS TO OFFER. IN A HURRY? 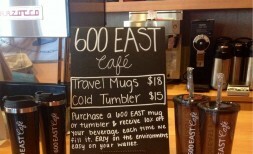 GET ANY OF OUR MENU ITEMS TO GO. 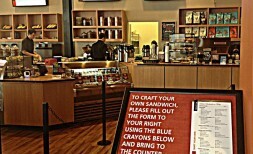 DELICIOUS FOOD ITEMS AND COFFEES WITH A FOCUS ON LOCAL INGREDIENTS. At 600 EAST Café in downtown Milwaukee, you’ll find delicious, locally sourced menu items for breakfast, lunch and catering. We’ve handpicked our favorite coffee blends, the freshest breads and bakery, and premium-quality meats and cheeses from purveyors around the state. And we strive to provide you with the best possible ingredients to craft our soups, sandwiches, salads and wraps. We also offer a full breakfast and lunch catering menu to help make your next meeting or event a success, and the adjacent 600 EAST Business Center provides the perfect location. Chipotle Chicken Salad- Chicken breast, bacon, roma tomato, sun dried tomato, mozzarella and crouton served on a bed of romaine with chipotle ranch dressing. 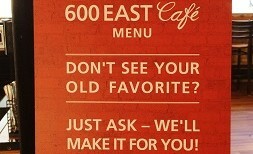 Stay up to date on 600 EAST Café. We’ll bring you all sorts of juicy updates and scrumptious tidbits.